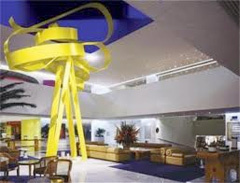 Presidente Hotels, the 3th most important hotel company in Mexico, operating its Hotels & Resorts under the InterContinental and Holiday Inn brand. 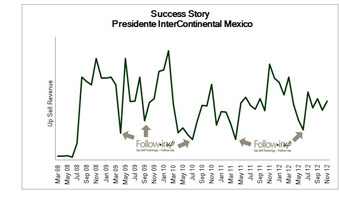 Grupo Presidente, owner of Presidente Intercontinental Hotels, the third largest hotel chain in Mexico, was looking for ways to increase his hotels’ ADR and RevPAR. Further, he wanted to increase ADR and RevPAR during the 2008 recession - a time when raising rates was difficult and occupancies were low. During 2009, Incrementa was able to provide Intercontinental with a solution to increase their revenues through Up Selling. They implemented Check In Up, Incrementa’s Front Desk Up Sell Program, in their 3 most important properties: Mexico City, Cancun and Guadalajara. They also implemented Book In Up, our Reservations Up Sell training at their Central Reservations Office. Due to the program’s success, the company decided to roll out and implement our Up Sell programs in their 7 remaining hotels, making it a Corporate Training strategy for the chain in 2010. In order to maintain positive results and continue with the success of program, Grupo Presidente contracted Incrementa to implement its Follow In Up program in 2011. In doing this, Intercontinental guaranteed that: all previously trained staff members understand the sales process of the program, new Front Desk and Reservations staff are properly trained, and Up Sell goals are maintained and achieved. The results were immediate. 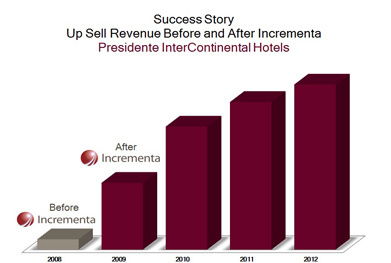 By the end of 2009, Intercontinental’s Up Sell revenues had grown more than 1,000%, impacting ADR and RevPAR. By 2010 they were reaching more than $1,000,000 in Up Sell revenues. A key element to their continuous success has been the implementation of Incrementa’s Follow In Up program. By emphasizing ongoing education, both previously trained staff and new staff members are taught how to effectively implement the Up Sell program and techniques. © Copyright 2013 Incrementa. All rights reserved.